President Donald Trump’s trade policy has led to a bitter Trade War between the USA and China. Now as per some reports the US is also considering a possible withdrawal of zero tariffs for India. According to Reuters, the US Trade Representative is completing a review of the country’s trade concessions to India, under which the emerging economy now enjoys zero tariffs on $5.6 billion of exports to the US. With the “Make in India” campaign initiated by Prime Minister Modi India has been rapidly developing its industrialization process. India has already a trade surplus with the US and it will continue to widen. Presently Trump complains that the US buys more from China than China buys from the US, so some Americans may start asking as to why the US is turning a blind eye to India. India has already become the third largest economy in the world and is rapidly trying to reduce the gap with the second largest. Even in GDP terms ( an unrealistic term) India is now the fifth largest economy. Now India is slowly becoming the next world manufacturing factory and therefore it may have an economic conflict with the US under Trump’s present trade policy. With the “Make in India” campaign becoming successful the chances of coming in conflict with US and European protectionist tariffs may increase. However chances of such conflicts are low. India certainly needs external markets like US but at the same time US too needs the Indian markets including the defence market. In fact to capture the lucrative defence market USA has been throwing various tantrums like CAATSA etc but to no avail. Now even the Americans have realized that NO ONE can threaten or coerce India and any sanction against India is meaningless. 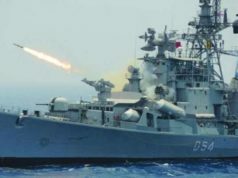 The USA is already in a trade conflict with China and also in a strategic posturing game against China in the Indo Pacific. So it needs India more than India needs USA. Thus Compared with the trade conflict between China and the US, bigger trouble will be there for Trump incase he simultaneously tries to annoy India. Made-in-India products have begun to enter Americans’ lives, and a stable customer base is emerging. So Trumps anti India action if any may lead to reduction in India’s exports to the US but it will still have a vast market in Central Asia, Russia, Africa, Middle East, Australia and Europe. However the American exports in luxury goods and defence items to India will just vanish. Trump’s trade policy is having a profound effect on the Chinese manufacturing and will result in global manufacturing redistribution. India, an emerging manufacturing country may stand to gain from this redistribution by playing its card right. India must aim to increase maximum FDI, which China has not been able to do in spite of its Belt and Road Initiative. In the fierce competition for investment in the manufacturing sector, a stable democracy like India has a huge advantage. 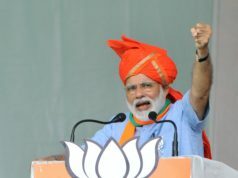 An Indian general election is due by May, and the growth and development made in last four years have started becoming visible and expanding day by day. Majority of the people have started realizing the importance of various reforms initiated by Prime Minister Modi. So it will be in total interest of US,the largest democracy size wise, that it does nothing to impede the progress being made by the largest democracy population wise. Previous articleTrap Set By UK To Choke IAF’s Neck.